Alcohols are the family of compounds that contain one or more hydroxyl (-OH) groups attached to a single bonded alkane. The carbon attached to OH define if an alcohol is “primary”, “secondary”, or “tertiary”. Not all functional groups containing OH are alcohols. Electron density in the O-H bond is strongly “polarized” toward oxygen. Hydroxyl groups greatly increase boiling points. The hydroxyl group imparts much greater water solubility upon organic molecules. Alcohols in aqueous solution are slightly less acidic than water. Alcohols are the family of compounds that contain one or more hydroxyl (-OH) groups attached to a single bonded alkane. Alcohols are represented by the general formula -OH. Alcohols are important in organic chemistry because they can be converted to and from many other types of compounds. Reactions with alcohols fall into two different categories: cleavage of the R-O bond or cleavage of the O-H bond. Name the longest carbon chain that contains the carbon atom bearing the ―OH group. Drop the final -e from the alkane name, and add the suffix -ol. Number the longest carbon chain starting at the end nearest the ―OH group, and use the appropriate number, if necessary, to indicate the position of the ―OH group. Name the substituents, and give their numbers as for an alkane or alkene. The first example below has a longest chain of six carbon atoms, so the root name is hexanol. The ―OH group is on the third carbon atom, which is indicated by the name 3-hexanol. There is a methyl group on carbon 3 and a chlorine atom on carbon 2. The complete IUPAC name is 2-chloro-3-methyl-3-hexanol. The prefix cyclo- is used for alcohols with cyclic alkyl groups. The hydroxyl group is assumed to be on carbon 1, and the ring is numbered in the direction to give the lowest possible numbers to the other substituents, as in, for example, 2,2-dimethylcyclopentanol. The carbon attached to OH is the key to understanding the most common classifications we use for alcohols, that being “primary”, “secondary”, and “tertiary” alcohols. To determine if an alcohol is primary, secondary, or tertiary, examine the carbon attached to OH. If that carbon is attached to one carbon, the alcohol is primary; two, secondary; three, tertiary. If zero carbons and three hydrogens (a unique situation) it is methanol. Hydroxyl groups attached to aromatic rings are called, “phenols”. Note that not all functional groups containing OH are alcohols. If the OH is attached to a carbonyl (C=O), that functional group is called a “carboxylic acid”. OH attached to an alkene is called an “enol” (ene + ol). And there are other funky functional groups such as hydrates (“geminal diol”) that really belong in a separate category from alcohols themselves. The key for understanding the physical properties of alcohols is to appreciate just how polarized the hydroxyl group is. Oxygen is “greedier” for electrons than hydrogen, so it be more “electron rich” (more negative) and hydrogen more “electron poor” (more positive) than they would be in a bond where electrons were shared perfectly equally. We say that electron density in the O-H bond is strongly “polarized” toward oxygen. Another way of saying the same thing is that the O-H bond has a strong “dipole”. Since opposite charges attract, these partial charges will line up in solution in a way where the partial negative oxygens on one molecule interact with the partially positive hydrogens on another. These interactions between molecules, which we call, “hydrogen bonds” are about 1/10 as strong as normal bonds, and are much more transient, lasting only a fraction of a second on average. Still, the effect of hydrogen bonding is to lead molecules to “stick” to one another. Hydroxyl groups greatly increase boiling points. Look what happens to the boiling point of propane (an alkane) when a CH3 group is replaced with an OH group – the molecular weights are the same, but there’s over a 100° C difference in boiling point. Replacing a CH3 on propanol with an OH group gives us “ethylene glycol”, a “di-ol” (actually called a “vicinal diol” since the alcohols are on adjacent carbons). Having twice as many hydroxyl groups, we would expect it to be even more polar than propanol, and thus have a higher boiling point. This is true – the boiling point of ethylene glycol is 197°C. The differences in boiling point between primary, secondary, and tertiary alcohols can be subtle. Generally, the more “exposed” the hydroxyl group, the more other OH groups it will be able to interact with, and the higher the boiling point. The isomers of butanol are a perfect example. See how the primary alcohols (1-butanol and 2-methyl-1-propanol) have higher boiling points than the secondary alcohol (2-butanol) which has a higher boiling point than the tertiary alcohol (t-butanol). The stronger of two acids will have a higher Ka than the weaker acid. Because the range of possible values for Ka spans many orders of magnitude, a more manageable constant, pKa is more frequently used, where pKa = −log10 Ka. 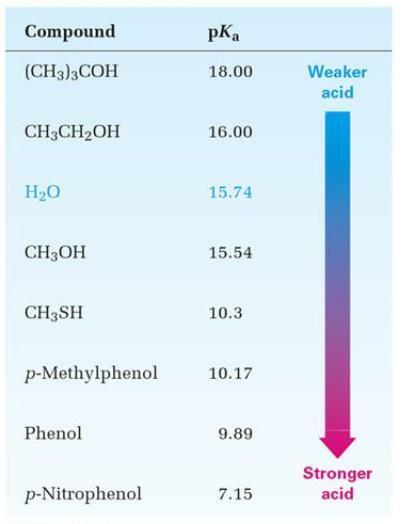 Stronger acids have a smaller pKa than weaker acids. In general, alcohols in aqueous solution are slightly less acidic than water. However, the differences among the pKas of the alcohols are not large. The differences in acidities are due to the effect of substituents in the 1-position removed from the acidic site. Moreover, the more highly substituted alcohols vary only in the structure two positions removed from the acidic site.